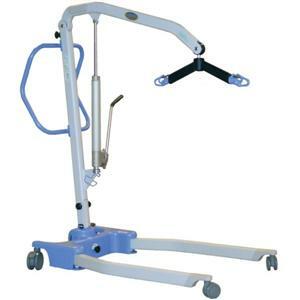 The Advance™ Hoyer Manual Patient Lift from Hoyer represents a true step forward in patient lift design and performance. It uses the very latest design and manufacturing technologies to ensure that the Advance is the most functional and stylish lift in its class today. Only hydraulic lift with tool-free folding design, perfect for storage under a bed or low chair. Safe Working Load: 340 lbs. Maximum Overall Length: 4 ft. 3 in. Minimum Overall Length: 4 ft. 1 in. Maximum Overall Height: 5 ft. 11 in. Minimum Overall Height: 4 ft. 5.5 in. Folded Height: 1 ft. 5 in. Folded Depth: 3 ft. 10 in. Folded Width: 1 ft. 10 in. Spreader Bar Maximum Height: 5 ft. 4.5 in. Spreader Bar Minimum Usable Height: 1 ft. 3 in. Spreader Bar Height at Maximum Reach: 3 ft. 9 in. Spreader Bar Reach at Maximum Height: 2 ft. 4 in. Spreader Bar Reach at Minimum Height: 1 ft 7 in. Spreader Bar Maximum Reach: 2 ft 9 in. Spreader Bar Turning Radius: 3 ft. 5 in. Leg Open External Width: 3 ft. 8 in. Leg Open Internal Width: 3 ft. 10 in. Leg Closed External Width: 2 ft. 1 in. Leg Closed Internal Width: 1 ft. 10 in. Leg Overall Height of Legs: 4.5 in. Front Twin Casters: 3.3 in. Rear Braked Casters: 4 in. Mast, Base & Boom Assembly: 64 lbs.